There is no denying the fascination for loud color that North Americans have when it comes to their horses. Gaited horses of color are becoming ever more popular, while the successful breeding of them remains quite elusive. It is no secret that in their countries of origin, excessive white and pinto markings are considered an undesirable trait. Whether for practical reasons, or perhaps folklore that eventually became tradition, the practice of breeding out white markings has narrowed the available gene pool of horses with excessive white or pinto patterns. Not only are breeders faced with increasing the amount of color on horses, but also increasing the frequency in which it appears. This must be done in conjunction with producing a horse that meets and or exceeds the breed standards, exemplifies the breed and overcomes the prejudice that may be encountered from more traditional breeders, trainers and judges. No longer can it be said that the horse with pinto markings does not have the pedigree or conformation or way of going that their counterparts without white may have. It is important that breeders of Pinto horses educate themselves on the genetics of pinto patterns, pedigrees and conformation in order to produce quality horses that have pinto markings. We must work with our associations to update records and increase understanding of the genetics of pinto markings. The Associations must update their standards and familiarize themselves with the correct terms and genetic guidelines to assist breeders in making the best possible decisions when it comes to breeding. Horses incorrectly registered or lacking information limit a breeder’s ability to make decisions when considering breeding plans. Following is a simplified horseperson’s guide to understanding color. 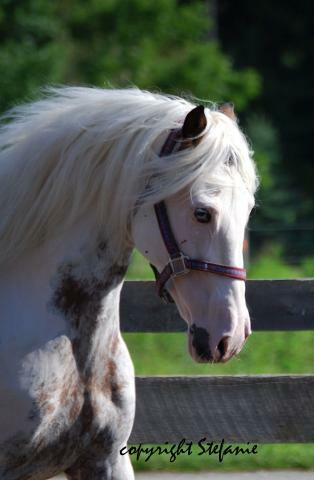 Pinto – Alternating patches of white and any other equine coat color appearing in random shapes and sizes. Types of pinto patterns found in the Paso Fino Horse. This is the most common pinto pattern, being either colored patches on a white coat or white patches on standard coat colors. Tobianos frequently have 4 white legs, a dark head, with or without typical markings (star,strip or blaze) and large patches with well defined edges, often rounded. Typical markings are patches in the flanks, the tail dock, on the chest and the neck with white crossing over the top line between the withers and croup. Tobiano is a dominant gene, this means that it requires at least one tobiano gene from one parent to express itself - this would be the heterozygous form of tobiano. A heterozygous tobiano has a 50% chance of passing the tobiano pattern to any of it’s offspring. The homozygous form of tobiano (requiring one tobiano gene from EACH parent) means that the probability of a horse passing on the tobiano pattern to all of its offspring is nearly 100%. Testing a horse for the genetic marker associated with the tobiano locus is done at many parentage testing and research laboratories or university equine programs such as UC Davis or University of Kentucky. There is no lethal homozygous form of tobiano. Breeding of two tobiano horses can produce tobiano(Tt) (heterozygous - one parent passed tobiano gene) 50% of the time, tobiano (TT) (homozygous - both parents passed tobiano gene) 25% of the time and SOLID (no tobiano pattern from either parent) 25% of the time. The Sabino pinto pattern can appear on any base color, but is most commonly found on chestnuts, including dilutes (palomino) and grays. Typically the Sabino pinto has extensive face and leg markings in a speckled or feathering pattern. Speckling appears on the undersides of the belly, neck and head. Sabino markings can be expressed as minimal - "sabino characteristics" all the way to maximum white sabino. Full sabino pintos are very rare and to date only a very few documented maximum white sabino Paso Fino. Some breeders as well as others that study equine genetics believe that all sabino patterns are controlled by one gene, expressed in degrees of white – this would lead to belief that a wide variety of markings are possible when mating horses with “chrome” or sabino type markings. The recent isolation of the sb1 gene indicates that this theory is not accurate. A number of breeds that commonly display "chrome" and high white did not test positive to for the sb1 gene. For those that believe sabino to be ploygenic, sabino is not merely a matter of the amount of white shown on a horse but in fact the amount of white is indicative of pattern type – this would explain why some breeds have only one type of sabino pattern (with the very rare exception) and why other breeds may display the full gamut of sabino patterns. There does not seem to be a standard set for the description of sabino patterns, for the purpose of this article I will break the pattern into four basic subtypes. Maximum White sabino – a white horse with dark eyes (occasionally 1 or 2 light blue eyes due to markings that are covered over by the sabino white) May be born with slight coloring in ears, mane and tail – this color generally fades within the first year. There is much discussion and perhaps even controversy pertaining to whether or not one or all or any of the sabino genes are recessive or dominant. There is strong basis to argue both theories, at this time more research will have to be done by breeders and scientist to determine dominant, recessive or co dominant genetics. The sabiano (also called tobino by some) is a pinto that obviously displays characteristics of both the tobiano and sabino genes and has the ability to pass either or both genes to any of its offspring. It should be noted that the Overo gene is not found in the pure Spanish gaited breeds. Although some breeds do consider sabino one of the Overo patterns, there is substantial evidence supporting the fact that it is controlled by another gene(s) and that it is not lethal in a homozygous state as is possible with some Overo patterns. (Overos have jagged crisp patches - usually on the barrel, neck and hips and have darker edging around each patch. White does not cross the top line between whither and croup). 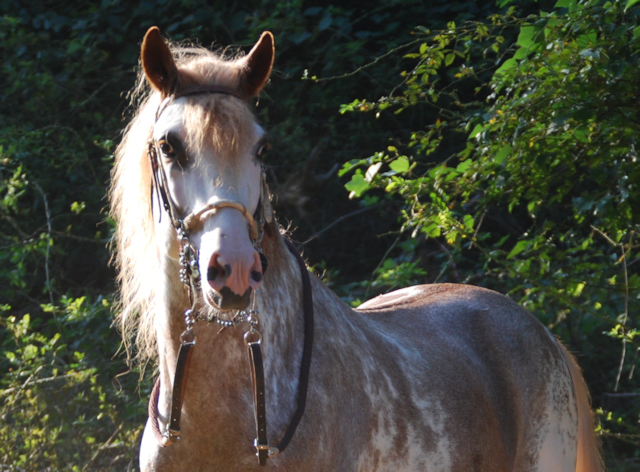 In addition to pinto patterns, there are a number of white modifiers such as Rabicano ticking, rount and typical markings that all increase the percentage of white on any one horse. At best breeders know that there are inherent risks to any mating, breeding for color is not as of yet an exact science and will require much more research and data compilation. There is no arguing that spring time on a farm that breeds for pinto markings is one of the most exciting places to be. One must remember that all horses start out 1 of 2 colors - red or black. After this it is a matter of building blocks of "factors" and "modifiers" that effect the two base colors. therefore black covers red in all instances. A recessive gene requires two copies (homozygous) to be expressed, chestnut horses carry two red genes and are always red in color. A dominant gene can be expressed (evident) in either the heterozygous or homozygous state. All other colors are the result of these 2 base colors with other factors and modifiers. Bay - either 1 or 2 black genes with 1 or 2 Agouti genes. The agouti gene controls the distribution of black pigment in a points pattern (mane, tail, lower legs, ear rims). The agouti gene does not affect the red gene because there is no black pigment to distribute.. A chestnut horse can be a carrier of the agouti gene, you just can not see the effects of it like you can on a black horse. Brown - either 1 or 2 black genes with 1 or 2 Agouti genes. A recent finding, the agouti gene at a different loci (a test is now available) restricts the black in a different pattern than that of the bay. The brown horse is a dark shade (hershey brown to near black) over the entire body, with just subtle tone changes in the soft points. Gray - The gray gene is the progressive loss of pigment throughout the horses coat. Gray is a dominant gene and can affect both base colors with or without other modifiers and factors (dun, creme, agouti etc). It does not alter the original genetics of the horse, so in order to calculate offspring color, you will need to know the original base color, factors and modifiers through testing or known background. **as of September 2008 DNA gray testing is available. Buckskin - base color black (1 or 2 black genes), add the agouti gene (1 or 2 copies of the agouti) and 1 creme gene (dilute). the agouti restricts the black to the points, the creme gene dilutes the "bay" body color to buckskin..
Black buckskin - base color black (1 or 2 black genes), no agouti gene and 1 creme gene (dilute). an all black horse in appearance, since there is no agouti to dilute the basic body color, there is nothing for the creme gene to dilute - the black can occasionally seem a dark brownish color or may fade some in the sun but the overall appearance is black. The horse does carry the creme gene and can pass on to offspring. Palomino - red base (both red genes) add 1 creme gene to dilute the red to gold. Perlino - base color black (1 or 2 black genes), add the agouti gene (1 or 2 copies of the agouti) and 2 creme gene (dilute). the agouti restricts the black to the points, the creme genes dilutes the "bay" body color to near white over the entire body and head (regardless of other modifiers and factors), including the eyes which will be an ice blue color. ..
Cremello - red base (both red genes) add 2 creme genes. The creme genes dilutes the red base color to near white over the entire body and head (regardless of other modifiers and factors), including the eyes which will be an ice blue color. As you can see, the possibilities are nearly endless, because each factor or modifier is located at different loci they continue to build on the base color. Patterns and dilute and other modifiers do not replace each other or cancel each other out, they continue to modify the look of the horse and what it's resulting offspring may be. Offspring get 50% of their genes from each parent. A sire or dam that is homozygous for any characteristic guarantees that one gene for that characteristic will be passed to the offspring. The more you know about the genetic background of your breeding stock, the more likely you can predict the results in the offspring. Breeding to add color is becoming more and more scientific, with advancements in genetic identification and understanding allowing breeders to make better informed decisions about adding color to their breeding program. There are a number of labs that can perform DNA tests for a variety of markers, helping breeders make sound breeding decisions utilizing science. Q - Does my solid coloured horse from tobiano parent(s) have the genetic background to produce pinto? identification of crypt tobianos more difficult. Crypt tobiano horses must have at least one tobiano parent. Q - Is my pinto gaited horse a Paint? A – No paint is a breed unto itself. It is based on color as well as pedigree from registered parentage of Paint, Quarter Horse and thoroughbred horses. Q – What is a tri-coloured pinto horse? 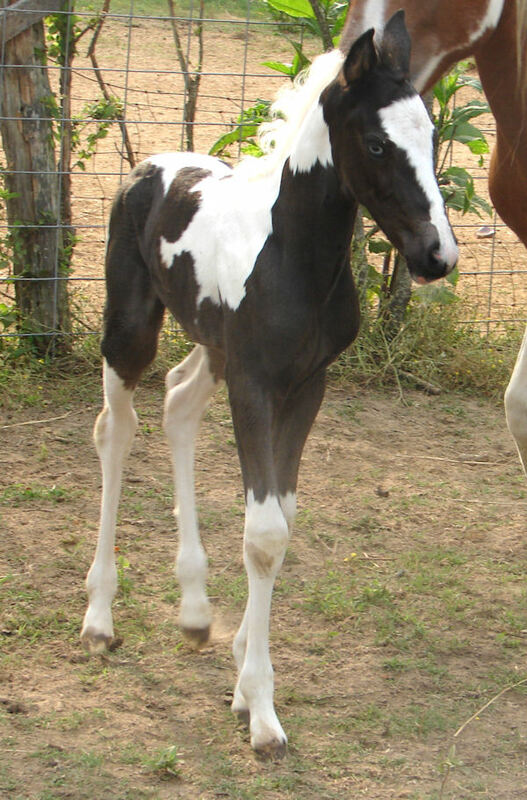 A – Tri –color is a term that incorrectly describes a bay or buckskin tobiano. The “3rd” color being black is actually the black points of the bay or buckskin base color. Mismarks (the equivalent of a birth mark) can also produce a different shade of base color on a horse but this does not mean that the horse is genetically capable of producing three colors. Q – Does a pinto with more white produce pinto foals more often? A – No, the amount of white will not increase the frequency of pinto offspring (unless the horse is homozygous), it may however increase the amount of white on any particular offspring. Q - Does a homozygous tobiano have more white that a heterozygous tobiano? A – No, the amount of white will not determine if a horse is homozygous or not. Q – Does a pinto usually produce it’s own markings? A – while some specific placement or type marking may be passed more frequently, it is not uncommon for tobianos to produce patterns completely different than their own. Sabinos however are more likely to reproduce their own pattern type when referring to full sabino pintos and maximum white sabinos, sabino characteristics (blazes and leg markings)may vary greatly. Q – Excluding breeding homozygous tobiano what is my best chance of breeding for pinto? A – Most breeders and those studying equine genetics believe that chestnut coloured horses that have white markings increase your chances of getting pinto markings when breeding a heterozygous pinto. Heterozygous - having one genes for a specific characteristic. Rount - larger blotches of frothy type ticking, typically found on belly, girth,under side of flanks and between hind legs. Warshield - dark patch on underside of neck, on chest and into front legs typically found on the tobiano pinto. Genetic testing labs - submission forms. Following are 4 different labs that we use. Check out the foal color predicting calculator by animal genetics. specializing in tobiano,sabino and sabiano paso finos. Pinto Paso Finos are one of the most sought after gaited horses in todays market.